Visualize escaping to your favorite vacation spot without ever leaving home. Many Alaskans are now living that dream. 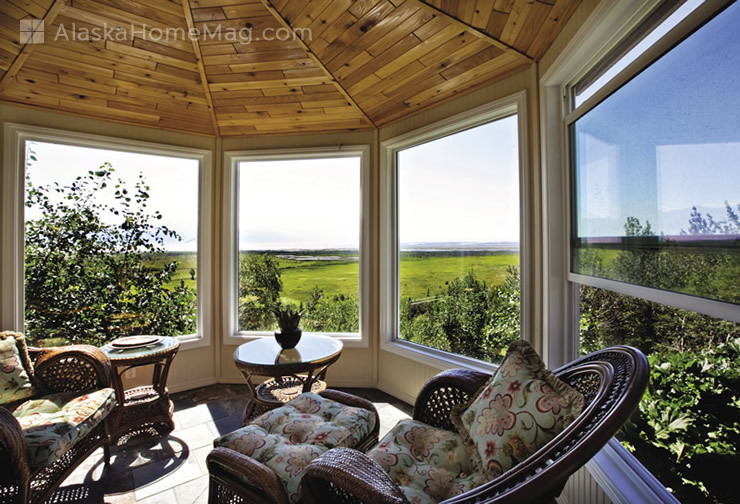 These flexible, enclosed living spaces are special sanctuaries filled with loads of natural light and an airy outdoor feel. They also boast unlimited uses – from a relaxing retreat to party central. So, why feel cooped up all winter long? Check out these three special spaces that make every day a vacation day, no matter what the season. The modernized gazebo was built with a cedar frame and Shakertown cedar siding. Karen especially likes the pattern of the cedar tongue and groove ceiling. 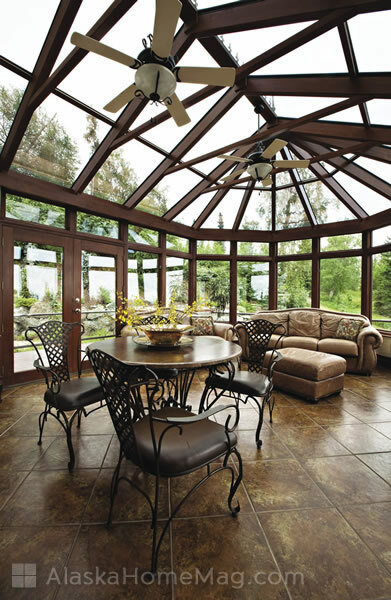 The slate floor and warm amber glow of the sconces give the gazebo a cozy at-home feeling – a perfect setting for a glass of wine after work. 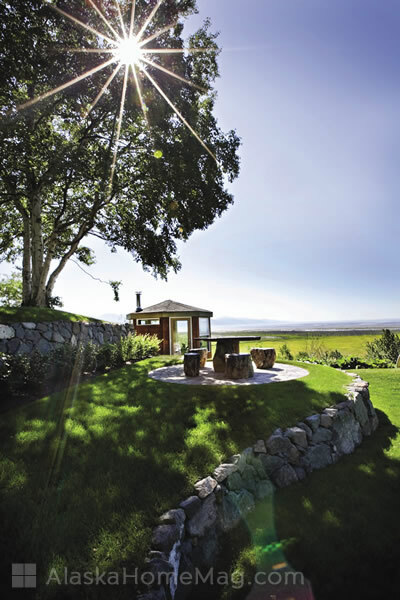 To ensure the space can be a year-round retreat, they installed a small wood stove made especially for small spaces. “When the first snowflakes fall it’s a great place to read,” Karen says. “I love the light we get in the conservatory, both in summer and winter,” says Lisa. 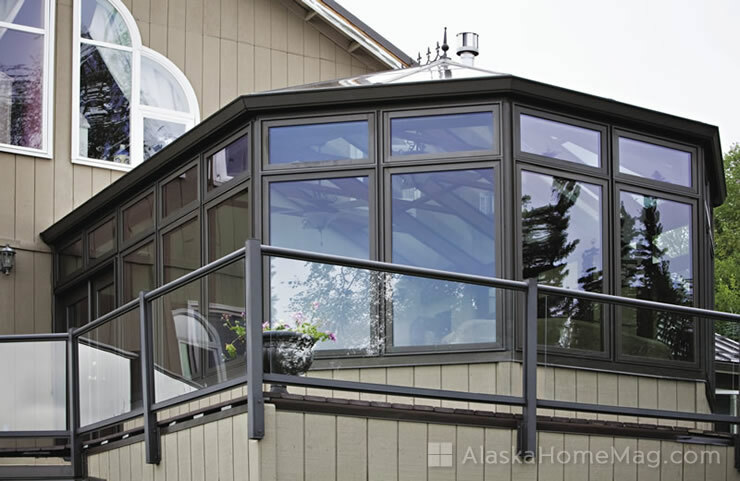 The high-performance windows ensure that the summers are cooler without glare and brightness, and winters are warmer by retaining the indoor heat. Because the Maurers’ home was built on a steep slope, they struggled with ground retaining issues. “We eventually brought in Faltz Landscaping, who re-built our retaining walls in boulders, and added a water feature at the steepest part of the slope that had become very difficult to maintain and plant. 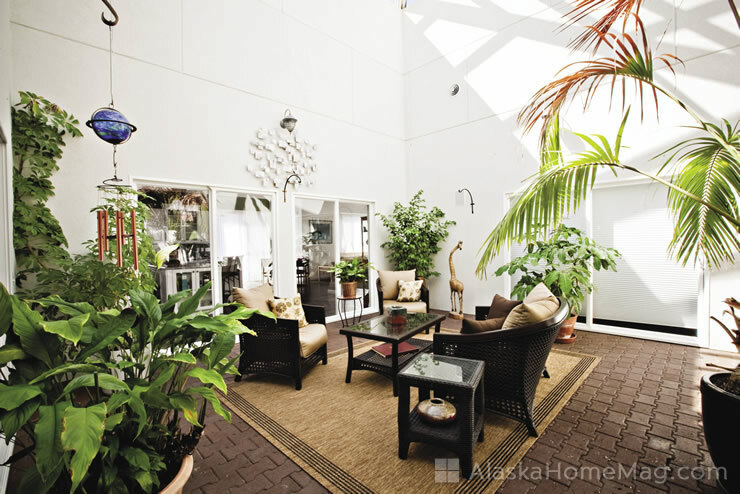 This gave us additional space for a stone patio just outside of the conservatory, and really helped to tie in our deck and conservatory with the outdoor space,” says Lisa. 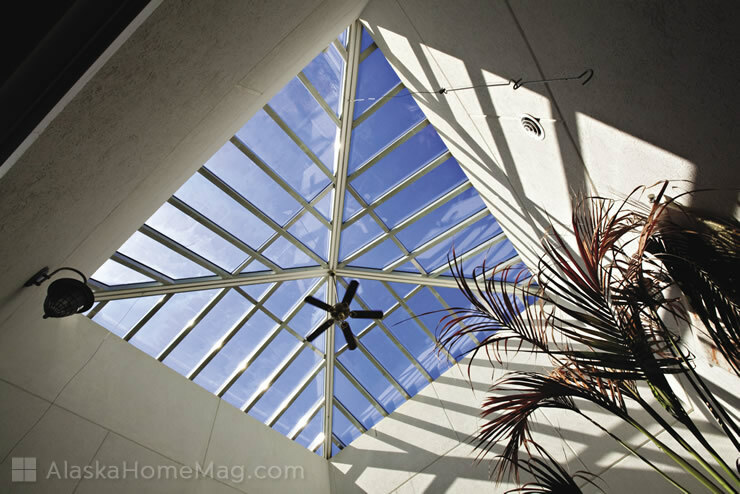 The 20-foot-tall atrium features a pyramid-like glass ceiling installed by Capitol Glass Northerm Windows, infloor radiant heat and a warm exhaust system so it doesn’t get too hot in the summer. Cheryl’s favorite aspect of the space is the ceiling. “It is most beautiful when it just starts to snow,” she says.